Jamie Purviance got the grilling bug not long after he graduated from Stanford, where he majored in economics. He accepted a teaching position in Indonesia’s capital, Jakarta. It was there – and in his travels across Southeast Asia – that Purviance became fascinated with cooking over live fire. He headed to the Culinary Institute of America, graduating with high honors. Today, Purviance is Weber’s master griller. He’s also a best-selling author and has written more than a dozen cookbooks, and contributed to many national magazines. 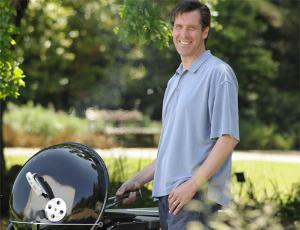 What are your top tips for home grillers? Give yourself at least two heat zones. If you set up your grill for one type of heat only, your options are limited. What if something is cooking too fast? What if your food is flaring up? What if you are grilling two very different foods at the same time? You should have at least two zones of heat: one for direct heat (where the fire is right under the food) and one for indirect heat (where the fire is off to the side of the food). That way, you can move your food from one zone whenever you like. Use the lid. Believe it or not, a grill’s lid is for much more than keeping the rain out. Its more important job is preventing too much air from getting in and too much heat and smoke from getting out. When the lid is closed, the grate is hotter, the grilling times are faster, the smoky tastes are stronger, and the flare-ups are fewer. So put a lid on it. Having said that, don’t forget to open the vents of a charcoal grill’s lid at least halfway. Every fire needs a little air to keep on burning. What types of grilled dishes are good candidates for basting with extra virgin olive oil during grilling – and what does the oil contribute? Portabella mushrooms are at their best when basted with good oil occasionally during grilling. Most of their water content evaporates over the high heat, potentially leaving them dry and bland; but if you marinate the mushrooms and baste them occasionally with extra virgin olive oil, they come off the grill with juicy textures and rich, smoky flavors. What are some of your other favorite ways to use extra virgin olive oil when grilling? In the world of grilling and barbecue, I use a lot of spice rubs and fresh herb mixtures to create flavorful crusts. I’ve found that the flavors seep into fish and meats a lot better when the spices and herbs are moistened and enriched with a flavorful olive oil. These wet pastes sear into the fish and meat without burning or scorching. Can you give us a quick marinade that uses extra virgin olive oil? This all-purpose marinade is one of my favorites. Grate one small white onion. You should get about ½ cup of grated onion and juice. Whisk that with ¼ cup fresh lemon juice, 3 tablespoons extra virgin olive oil, 3 tablespoons soy sauce, 2 teaspoons Dijon mustard, and 1 teaspoon freshly ground black pepper. Do you like to use extra virgin olive oil as a finishing oil for certain dishes – and, if so, which dishes? Yes. Something really special happens when you take a sizzling steak off the grill and finish it with a sprinkling of salt and drizzle of extra virgin olive oil. The oil mingles with the spices and the meat juices to make an instant, awesome sauce. Do you use olive oils with different flavor profiles for different foods and, if so, could you please offer a few examples or rules of thumb for pairing foods and oils when you’re finishing a dish? I like the peppery oils especially for finishing steaks. The oils with greener flavors of fresh vegetables and herbs work really well when finishing grilled shrimp or swordfish. Is there a simple grilled dish (one that doesn’t require a recipe) that uses olive oil that you could share with our readers – be it a vegetable, main dish, etc.? Here is a great little recipe for making steak fries on the grill. Cut some russet potatoes in half lengthwise and then cut each half lengthwise into ½-inch slices. It’s very important that the slices are thin enough. Otherwise they will burn before they are fully cooked inside. Brush the slices with extra virgin olive oil and season them with salt and pepper. Grill them over direct medium heat, with the lid closed, until tender inside and crispy outside, 15 to 17 minutes, turning occasionally. Serve with your favorite condiment. I serve them with a rosemary-lemon aioli.